I saw this today at the Venice film festival and was really blown away. This was an Italian film with impeccable cinematography, superb acting and fantastic direction, the music was a great accompaniment as well. I can't say enough great things about this film, it really moved me. I didn't know what to expect from director Michele RHO, whom I've never heard of until today, but he really has something here. 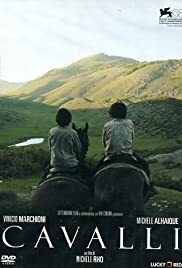 The film is set in what I believe was the mid 1800's (there is a scene with fireworks so I'm thinking that might have been the 1860's when Italy officially became a country) and follows two young brothers, about 14 and 12 if I were to guess. It fast forwards to them as young men and chronicles how their lives changed and intersected once again and the people they come across. I'm not going to give any more details as I don't want to spoil anything but I'm prepared to give this a 10 as I didn't come away with one single negative. I would expect this to garner some attention come awards season.